Geshe Tenzin Dorjee-la was born in the Lhatse district of Tsang province in Tibet. 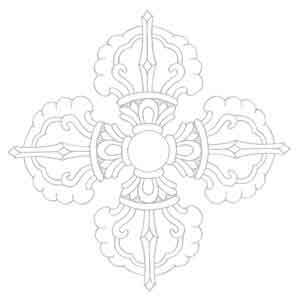 His father who had been a monk in the past, later married and became an administrator of a large estate. Geshe Tenzin Dorjee-la had three brothers and three sisters. Two of his brothers became monks. His mother and Sera Je Khensur Rinpoche (Geshe Donyo-la) were brother and sister. The uncle who was Geshe Donyo-la's older brother influenced Geshe Tenzin Dorjee-la to become a monk. Geshe Tenzin Dorjee-la was ordained at six years of age at the Lhatse Cho De Monastery, which had been founded by the Great Fifth Dalai Lama. At age 8, he became a Getsul. He lived at the monastery with his uncle Wangchuk Chopal, who was his teacher. Another important teacher there was Tsangpa Thundrup-la, who was very strict and oversaw his memorizing. Jangtse Choje (Gyume Khensur Rinpoche) was at the monastery at that time. Sera Je Khensur Rinpoche (Geshe Donyo-la) had already left at age 17. Later, when Geshe Tenzin Dorjee-la was 13, his uncle Sera Je Khensur Rinpoche, returned to Lhatse Cho De Monastery, and took him to Sera Monastery in Central Tibet where he remained for 8 years in Tsangpa Kham Tsen. At Sera he met Venerable Geshe Lhundub Sopa-la who became his main teacher. Geshe Sopa-la spent much of his time teaching many classes at the monastery. Other important teachers for him were Khensur Lhundup Thapkay-la; Gen Ngawang Gendu-la who was Yangsi Rinpoche's predecessor; and Geshe Ngawang Rik Sal-la. Geshe Tenzin Dorje-la's dharma relationship with Sera Je Khensur Rinpoche focused on memorizing. At Sera, he studied in the same class with Khamlung Tulku and Geshe Sherab Thabkay-la, a long-time resident teacher at Deer Park. Geshe Tenzin Dorjee-la remained at Sera Monastery for 8 years, reaching about half way through his Prajna Paramita studies before he had to flee the Chinese Communist invasion. In 1961 he fled from Tibet with Sera Je Khensur Rinpoche, Geshe Ngawang-la, and Tzong Tse Rinpoche who now lives in Germany. On first arrival in India they stayed in Kalimpong. From there they went to Manali to work as laborers on road construction for one year; followed by one year in Simla. Next he went to Buxador, India, one of the principal settlement sites of the Tibetan monastic community in exile. He had tried to go there when he first got to India, but it was already full with 1,500 monks. The Junior Tutor Kyabje Trijang Rinpoche had suggested road construction. There were many monks and even tulkus working on road projects, and Geshe Tenzin Dorjee-la claimed the work wasn't too hard. He stayed at Buxador for 8 years before going down to Sera Monastery in Bylakuppe. There, he and Geshe Sherab Thabkay-la again studied together in the same class. In 1985 they both got their geshe degrees at Sera. Geshe Tenzin Dorjee-la received the highest geshe degree, the lharampa rank. For one year he acted as the gegu or disciplinarian at Sera; 1 year as changtso or treasurer; and 3 years in finances. While Geshe Tenzin Dorjee-la was teaching at the Vajra Yogini Institute in France, Geshe Lhundub Sopa-la invited him to come to Deer Park to live and teach. He initially came to Deer Park in 2008 and then returned to France to finish his three year contract. After that he went on pilgrimage in India and finally returned to Deer Park in March 2009. 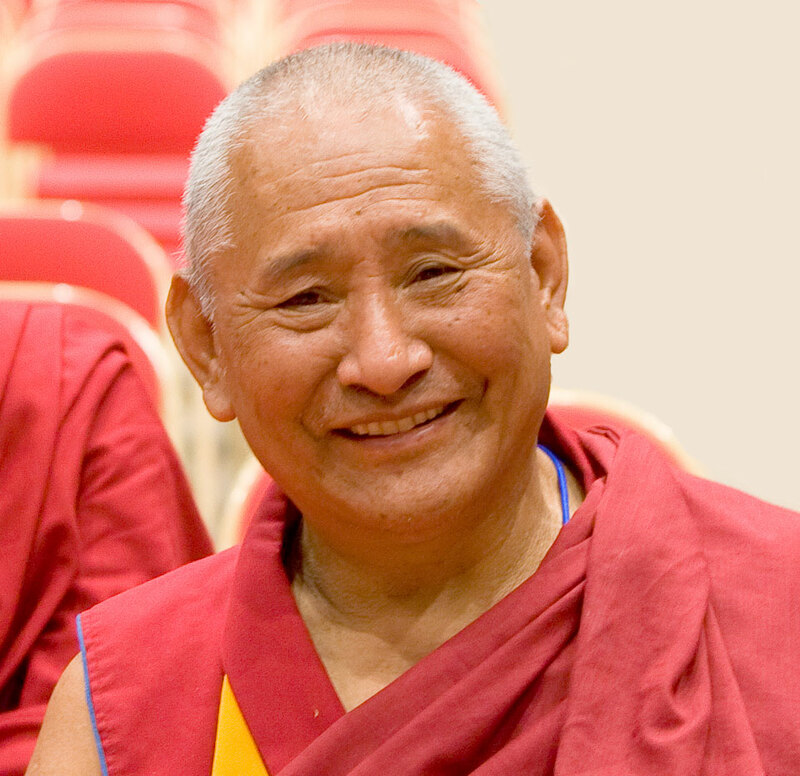 Geshe Tenzin Dorjee-la serves as the current abbot of Deer Park Buddhist Center, where students now have the great good fortune of studying with this very accomplished and practical teacher. Many thanks to Khamlung Tulku for translation and help with this interview which was conducted by Ann Chávez in May 2010.